What would you do if you saw a man walking around with Gummie Bears in his beard? Or, what if you came across a fellow who had a bunch of toy dinosaurs in his beard? I would surely do a double take and probably pinch myself because wacky stuff like that only happens in a dream, right? Ladies and gentlemen, prepare to be amazed. Will it Beard is a hilarious website that deserves only the loudest possible praise and applause. It features a bearded creative that enjoys nothing more than photographing his beard with strange objects in it. It’s that simple. 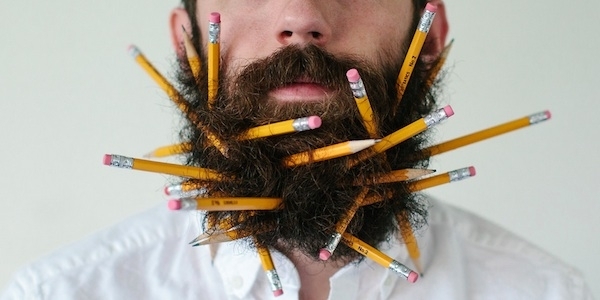 Put something funny in the beard, snap a photo, and share it on the Internet. Genius! My speech therapy students simply cannot get enough of what he does! From the moment that I first showed these pictures to my kiddos a few weeks back, they’ve been hooked. Instantaneously, my speech therapy room was flooded with a tidal wave of laughter. His unique style of art effortlessly generated joy in my speech therapy room, and that joy naturally transitioned to a large amount of conversation that perfectly coincided with my students’ speech therapy goals and objectives. So I want to tell my my fellow speech-language pathologists about these pictures, in hopes that they will show them to their speech therapy students, too. How is this picture silly? Describe it to me. A common objective that more than a few of my students are working on is the ability to recognize and describe absurdities. We use these pictures as clear visuals that act as food for thought. For example, let’s look at this picture of the beard filled with bows. With a bit of age-appropriate prompts and cues, I was able to get one of my 4th graders to verbalize how bows should not be in your beard; rather, they should be in your hair. This response was HUGE for this particular student and I clapped VERY loud when he not only made this connection but effectively communicated it to all of us around the speech table. Tell me about the pros and the cons. What my students have helped me to realize with these pictures are that there are always some good situations, and there are always some bad situations. For example, one of my 5th graders looked at this picture of the beard filled with balloons and proceeded to tell me the following. “Well, if he was skateboarding and accidentally fell flat on his face, he wouldn’t hurt his teeth because the balloons would protect him. That’s a good situation. However, if he put too many balloons in his beard, he might float away and get eaten by a hungry eagle in the sky. That’s a bad situation.” All of that makes sense to me! Let’s draw some pictures of other beards that we think would be crazy. 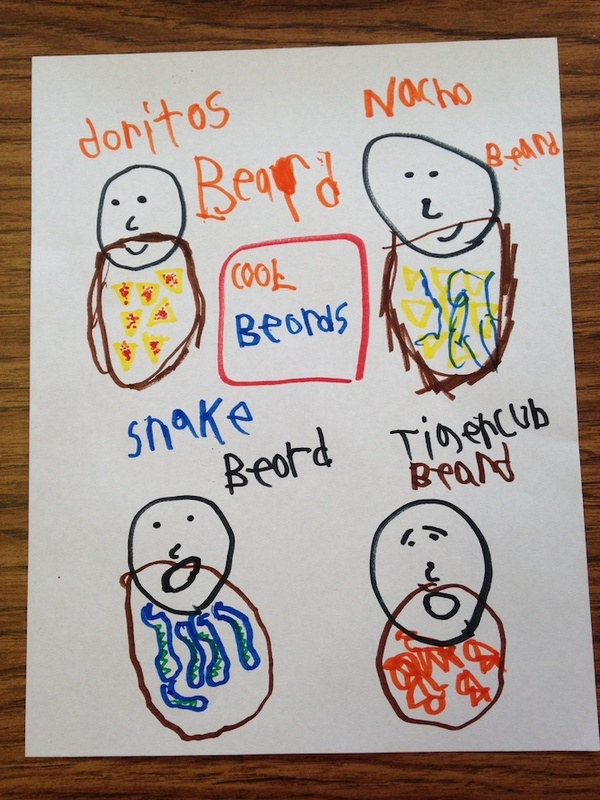 Check out this drawing that a kiddo made (snake beard! eek!). 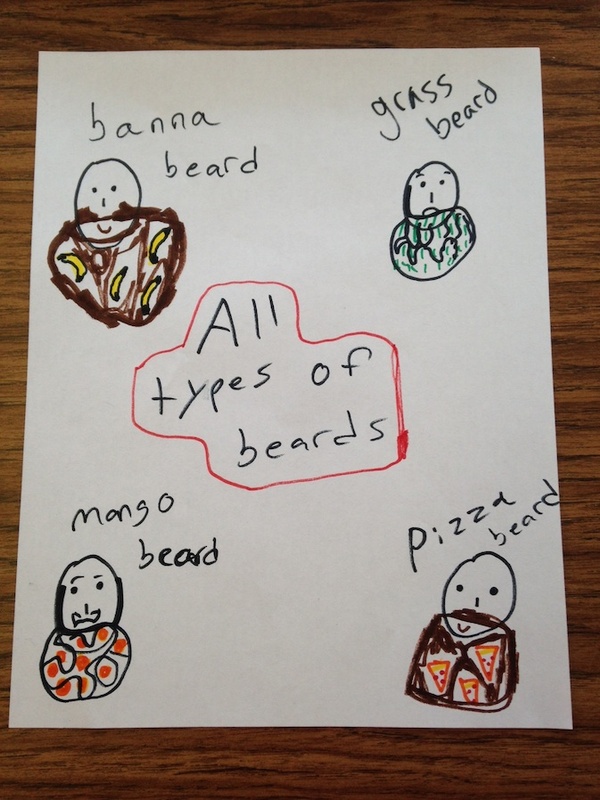 Oh, and this illustration is sure to make you hungry (pizza beard, yum!). All of these ideas came from my students’ smart brains, but if it wasn’t for seeing the pictures at Will it Beard in the first place, the ideas would have been much more difficult to get down on paper and describe. 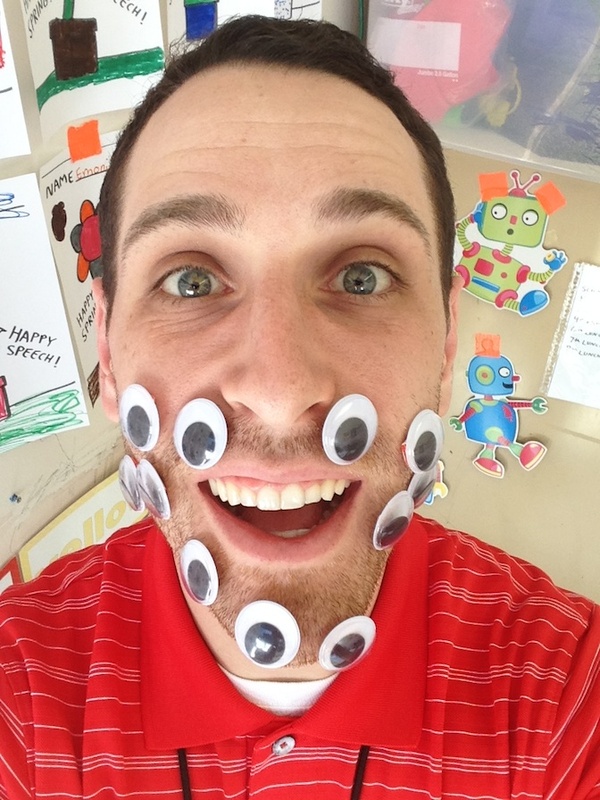 I hope that these beard pictures inspire you and your young learners to think about facial hair in a brand new way. Please do check out Will it Beard and let me know how you incorporate his fabulous works of art into your fabulous speech therapy setting. Have fun! Topic: Speech Therapy Idea | Visit my blog archive for more!